Category: A5 Leaflet Design and Pull-Up Banner Design, Foxford, Co. Mayo. Snap Me Smiling are a new innovative company who can provide a portable photobooth for your wedding day. Designwest had created the branding design concept/logo design for this Mayo based client in mid 2011 as well as a website. 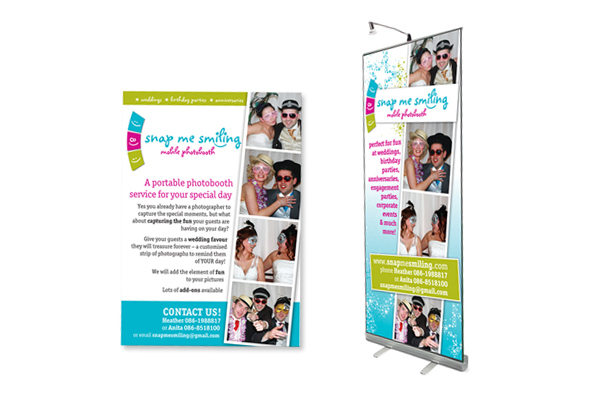 The client required more marketing material in the form of a leaflet design and pull-up banner design. 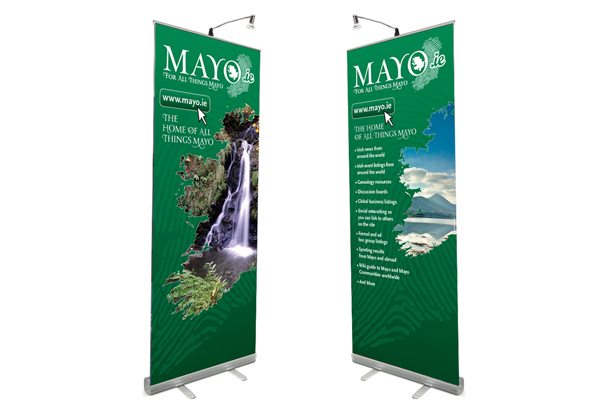 Category: Pull Up Banner, Roll up Banner Design, Foxford, Castlebar, Co. Mayo. 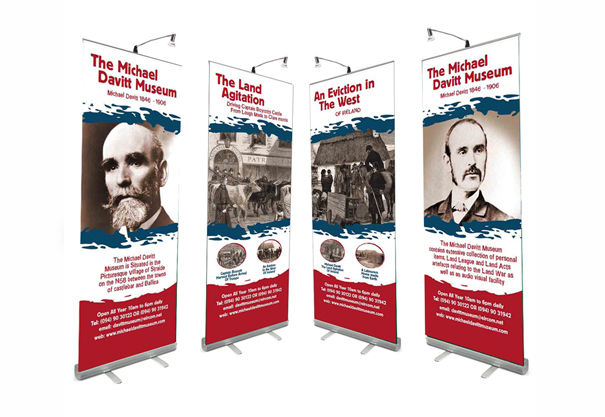 The Michael Davitt Museum contacted designwest requiring a few similar but striking designs for Pull up banner designs for the Museum which is located near Straide, Foxford in Co Mayo. The designs required touching up some old photos and adding a consistent sepia tone to all of them so they would all look like they are part of the same design. The end result are 4 roll up banner designs that the staff at the Museum were thrilled with. We look forward to working with the Michael Davitt Museum again in future products if only because we learned a little about our history along the way! Category: Business Cards and Pull Up Banner, Dublin, Ireland. Client: Sinnott & Company Solicitors. Dublin based solicitors Sinnott & Company approached Designwest to create a business card design that was more unusual and striking than standard cards, while retaining a professional and established demeanour. The end result is a clever business card design that uses a die-cut shape and a restrained and elegant colour palette – simple but very effective! 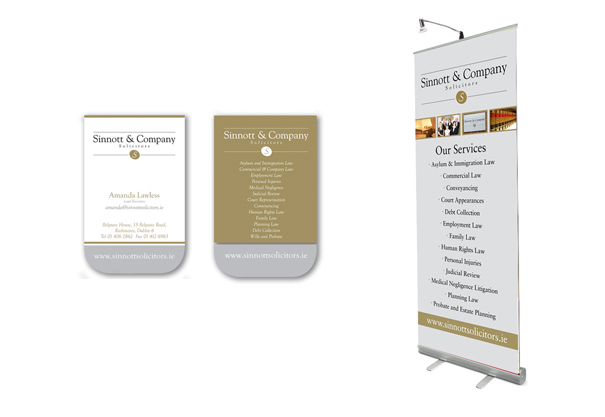 Designwest also created a pull-up banner design consistent with the card design in a larger format to promote the specialist services of the firm. Category: Identity Design, Promotional collateral and citation designs. Homecare Medical Supplies, in conjunction with Midwest Radio, came to Designwest to create the identity design, promotional collateral and citation designs for the first annual Golden Years Awards, celebrating the contributions of elderly people in the Mayo community. From initial promotional pieces including signage design, posters design, pull-up banner designs, brochure designs, advertisement designs, and application forms, Designwest also created the certificates given to the finalists and winners. Designwest also worked with Westport based photographer Eamonn McCarthy to coordinate beautiful framed prints which were awarded to the winners and judges to commemorate their hard work and achievements. Despite tight deadlines, the Awards were very successful and will hopefully take place for years to come!